The future of the GOP Healthcare billThe Republican healthcare reform bill gained immense traction this year. In their third attempt at putting a healthcare bill forward, the senators and the White House officials have been working round the clock to gather up votes, but somehow, the reservations persist. The lawmakers have insisted that Americans would not lose their vital insurance protections under their bill, including the guarantee that the plan would protect those with preexisting conditions. However, as it so happens, even these plans have been put to rest. Perhaps sometime in 2018, the GOP may pass a budget setting up reconciliation for tax reform, and then pass tax reform. Then, they would pass a budget setting up reconciliation for Obamacare repeal, and then pass that- it all remains to be seen. The ongoing shift to value from volumeDespite speculations, healthcare providers, as well as CMS have pushed for more value-based care and payments tied to quality, but it’s been going slow. Although providers have been slightly resistant to take on risk, they do recognize the potential to contain costs and improve quality of care over value-based contracts. And perhaps as data assumes a central role in healthcare, the increasing availability of data and smarter integration of disconnected data systems will make the transition easier and scalable. Notably, with a $3.3 trillion healthcare expenditure this year, there has been slow down the cost growth. 2018 is expected to be much more impactful as it builds on the strong foundation. Big data and analytics translating data into real health outcomesBig data and analytics have always brought significant advancements in making healthcare technology-driven. With the help of big data and smart analytics, we are at a point in healthcare we can make a near-certain prediction about possible complications a patient can face, their possible readmission, and the outcomes of a care plan devised for them. Not only it could translate to better health outcomes for the patients, it could also make a difference in improving reimbursements and regulatory compliance. Blockchain-based systemsBlockchain could arguably be one of the most disruptive technologies in healthcare. It is already being considered as a solution to healthcare’s longstanding challenge of interoperability and data exchange. 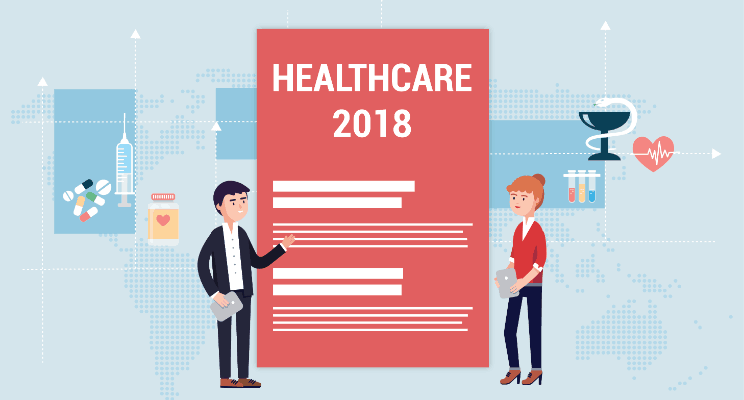 Bringing blockchain-based systems will definitely require some changes from the ground up, but 2018 will have a glimpse of by innovation centered around blockchain and how it can enhance healthcare data exchange and ensure security. AI and IoT taking on a central role2018 can witness a good amount of investment from healthcare leaders in the fields of Artificial Intelligence and Internet of Things. There is going to be a considerable advancement in technology, making the use of technology crucial in healthcare and assist an already unbalanced workforce. AI and IoT will not only prove instrumental in enhancing accuracy in clinical insights, and security, but could also be fruitful in reducing manual redundancy and ensuring fewer errors as we transition to a world of quality in care. Digital health interventions and virtual care to improve access and treatmentIn December 2016, many were suggesting that wearables were dead. Today, wearables are becoming one of the most sought-after innovation when it comes to digital health. And, the market is quickly diversifying as clinical wearables gain importance and as several renowned organizations integrate with each other. Not only wearables- there are several apps and biosensors that can assist providers with remotely tracking patient health, engage patients, interact with them, and streamline care operations. As technology becomes central to healthcare, 2018 will be the year when these apps and wearables boost the patient-physician interaction. The increasing importance of securityWe deal with a tremendous amount of confidential and critical information in healthcare. It’s not just patient health information- it goes from credit card information to digital footprints. As the plethora of devices and systems storing information grows in size, a focus on ensuring becomes extremely vital as a breach could range from something as slight as information being stolen to as dangerous as a person being physically harmed. 2018 may be high time we took a good, hard look at the security of our infrastructure. The future of ACAThere have been several debates and speculations regarding the future of the Affordable Care Act. With a new GOP healthcare bill on the cards, some things will stay the same, but with differences- people can still sign up on healthcare.gov, but the sign-up period would be shorter. They can still get subsidies to help lower their premiums or reduce their deductibles and copays, but some plans will be much more expensive. The future of ACA is still cloudy, and the attempts to repeal and replace ACA have been laid to rest, for now, but one thing is certain- a lot fewer people will enroll for ACA in 2018, fearing a repeal.